Our dentists strongly recommend that by the age of four or five, children should be attending regular evaluations and hygiene appointments with a trusted professional. Here in Silver Lake and Topeka, one of our friendly and dedicated hygienists will carefully review your gums for any telltale signs of periodontal disease. We take this threat very seriously, and we’re always here to help at Michel Dental, whether we’ve managed to catch it before any serious symptoms began or we need to provide restorative care. Why Choose Michel Dental for Checkups & Cleanings? If our team does locate signs of periodontal disease, our recommendations may vary. In mild instances, an improved homecare routine may be enough to make a difference. One of the first signs of gingivitis is sensitive gums that may bleed when you brush or floss. Don’t let the sight of blood curtail your brushing and flossing! These are both key steps in reversing the early effects of gum disease because both work to remove plaque—that sticky film in your mouth that hides the bacteria that leads to gum disease. Patients of all ages should be visiting the dentist for an evaluation at least two times a year, or once every six months. These important visits allow our team to locate potential problems and provide treatment as soon as possible. 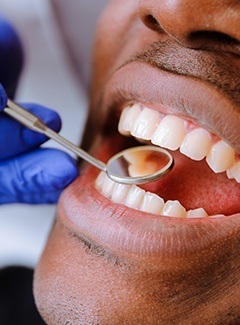 This involves inspecting the soft tissue for signs of oral cancer or periodontal disease, assessing damage on specific teeth, verifying the effectiveness of current dental restorations, and more. If needed, we can also provide quality-tooth colored restorations to replace traditional metal ones. Your dental checkup is also the time for our dentists to offer you suggestions on how you can improve your oral hygiene care at home. Yes, there is a right and wrong way to brush your teeth and floss! For the best results, which may mean an easier and quicker cleaning in our office, take our advice and brush for at least two minutes twice a day and floss at least once. Is it time for you to schedule an appointment? Michel Dental has two convenient locations: one in Silver Lake and another dental office in Topeka. We’d love to invite you into our warm and welcoming office environment. Please contact us today if you have any questions or if you’re ready to come in.